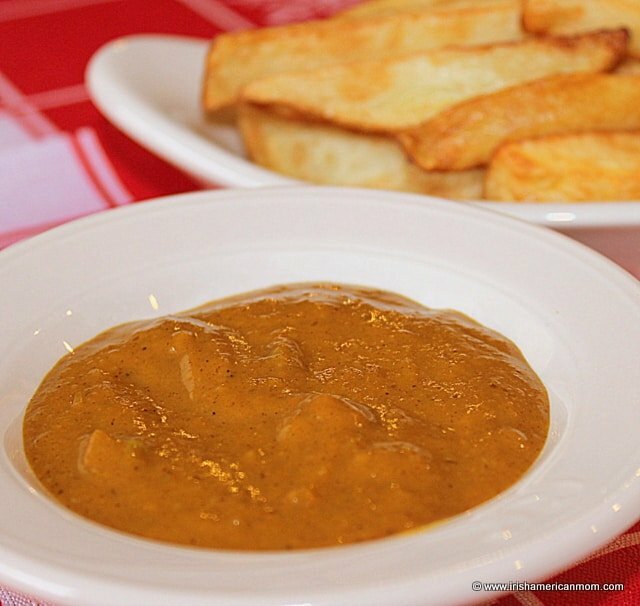 This chip sauce is different to a regular Indian curry. It has fewer veggies and is slightly less hot and spicy, with a satisfying sweet flavor. I received an e-mail from a reader a few weeks past. She requested I share my curry sauce recipe which I mentioned when I showed you how to make perfect Irish chips. She first tasted this unique combination on a trip to my homeland. A waiter suggested she try curry sauce with her fries and she loved it. She savored this treat many more times before returning to the US, where ever since she has been searching for a recipe to help revive her tasty memories of Ireland. 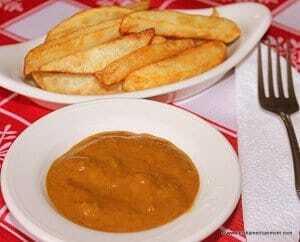 This may not be gourmet food, but in Ireland chip shops make gallons of curry sauce to satisfy their hungry customers. I confess I never bothered making it from scratch when I lived in Ireland. There didn’t seem to be any point, when it could be so easily found at the local chipper, or made by simply adding hot water to a dried, powdery concoction of who knows what. I am pretty certain that’s how chip shops create their signature sauces too. Once I moved to America I discovered curry sauce was not to be found. I needed to create my own homemade version to satisfy my curry cravings. So today, here is my recipe for chip shop curry sauce. Next step is to prepare the spice blend for the sauce. In a small bowl or ramekin add the curry powder, turmeric, cumin, ground coriander seed, and cinnamon. I love the browns and tans of the spices in the bowl. I use Sharwoods hot curry powder which I can buy in my local Meijers supermarket. If you prefer a lower spicy, heat level then use an American mild curry powder. The difference is significant. Add the oil to a large skillet over medium to high heat. Add the onions and saute for 4 minutes. Caramelized onions add delicious sweetness to the sauce. Next add the peeled and diced apple to the pan and saute for another 2 minutes. Toss in the minced garlic and ginger. Next comes the aromatic spice blend. 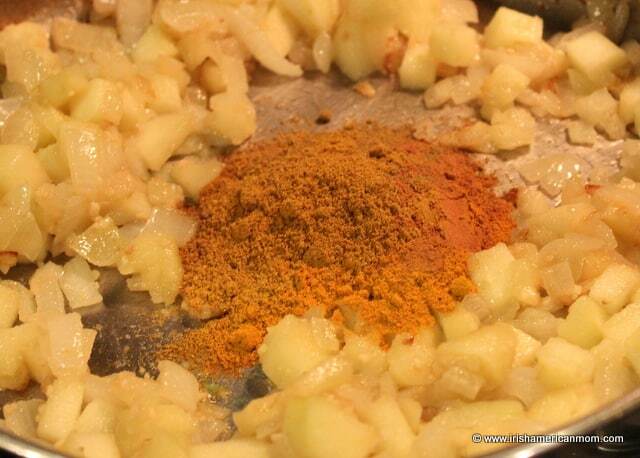 Mix the spices and onions together as they cook for another minute. Flour is my sauce thickener of choice. Cook it over medium heat for 2 minutes, scraping the bottom of the pan as you combine the mixture completely. The flour can burn and stick to the bottom of the pan very easily. See how my pan is getting a little crusty looking. That’s because I stopped stirring to take a photo. Now lets get saucy. 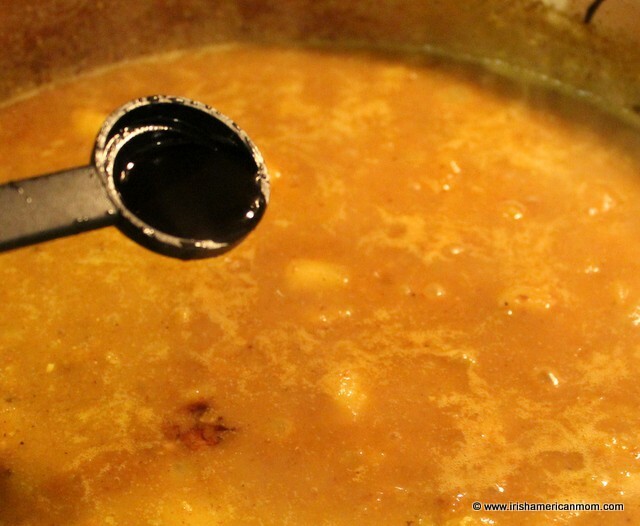 Gradually add the stock while you constantly stir the mixture to prevent lumps forming. 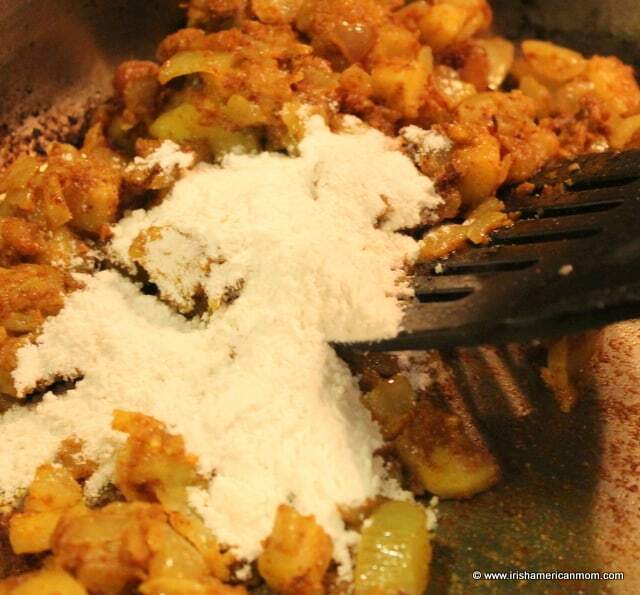 Scrape the bottom of the pan as you mix everything together. Bring it to a boiling point, then reduce the heat so the sauce is just simmering. Now comes my secret ingredient. I add a teaspoon of worcestershire sauce, not a typical curry requirement. I just love the extra dimension it adds to the exotic flavors of this sauce. A hint of sweetness is next. Add the tomato paste and two teaspoons of sugar. Season with salt and pepper and mix everything together. Simmer the sauce for 15 minutes to allow the flavors to meld. Some cooks like to add a teaspoon of lemon juice at this point, but I prefer not to detract from the sweetness of my curry sauce. Feel free to try it if you want to add a little freshness at the end. Decision time has now arrived. To blitz or not to blitz that is the question. 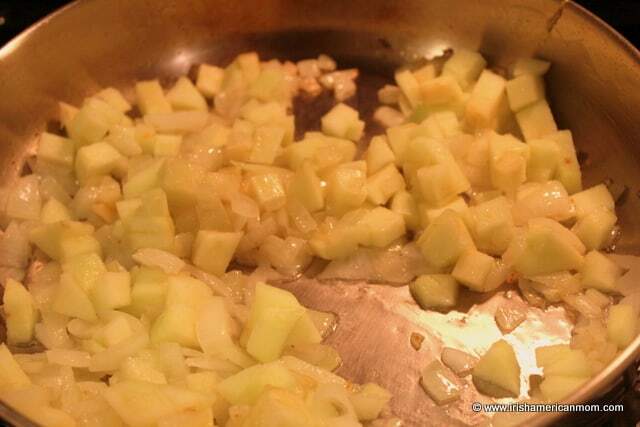 If you prefer a textured sauce with lumps of apple and caramelized onion then skip this step. In our house there is no skipping a little spin in the blender. 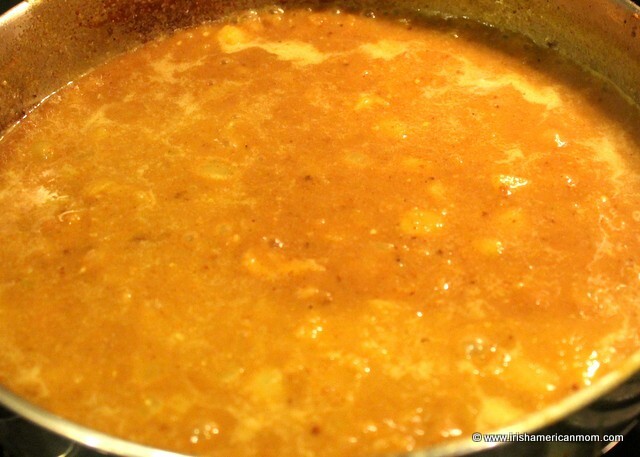 My husband likes onion flavor, but detests their texture, so I always make a smooth curry sauce. Before blending turn the heat off under the pan and allow the sauce to cool a little. This is a precautionary step just in case of blender accidents. Sticky, boiling curry sauce can easily burn. Believe me – I know. I’ve had a few blender explosions in my day. I now always hold the lid down with a dish towel when I switch the beast on. When ready pour the sauce into the blender and blitz until smooth (1 to 2 minutes depending on how powerful your blender is). Return the sauce to the pan and turn the heat back on. Time for another decision – to add raisins or not. I love the sweet surprise of golden raisins in this spicy sauce. If you decide to go with them, then just toss them in and stir them around. Then you’re ready to serve your spicy sauce with perfectly golden chips or fries. Just one more decision to make. Do you pour your sauce all over the top of your chips? Or do you prefer to dip your chips? Big, big decisions! But what ever your final eating style, just enjoy. Step 1 Prepare the spice blend by mixing the curry powder, turmeric, cumin, ground coriander seeds and cinnamon in a small bowl. Step 2 Heat the oil in a large skillet. 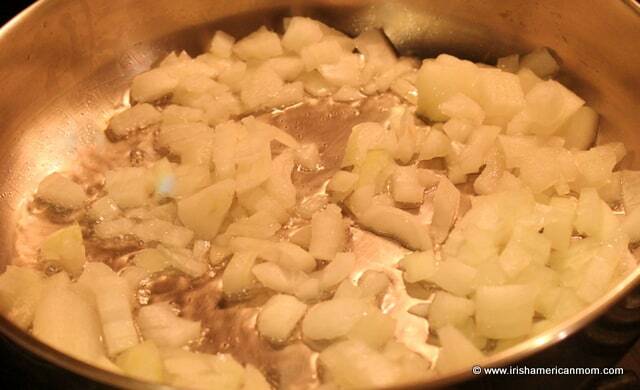 Add the onion and saute for 4 minutes over medium heat.. 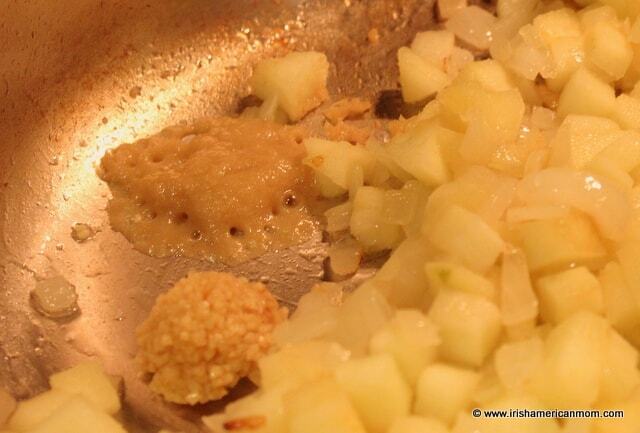 Step 3 Add the diced apple and cook for another 2 minutes. Step 4 Add the minced ginger and garlic and stir. Step 5 Add the spice blend to the onion mixture and stir constantly as it cooks for 2 more minutes. Step 6 Add the flour and stir constantly as it cooks for 2 minutes. Scrape the bottom of the pan to prevent burning. Step 7 Gradually add the chicken stock, stirring constantly to prevent lumps from forming. Step 8 Add worcestershire sauce, sugar, tomato puree and stir. Season with salt and pepper. Step 9 Bring the sauce to boiling point, stirring constantly. Then reduce the heat to low and simmer the sauce for 15 minutes. Step 10 Turn the heat off, and allow the sauce to cool slightly before blending. 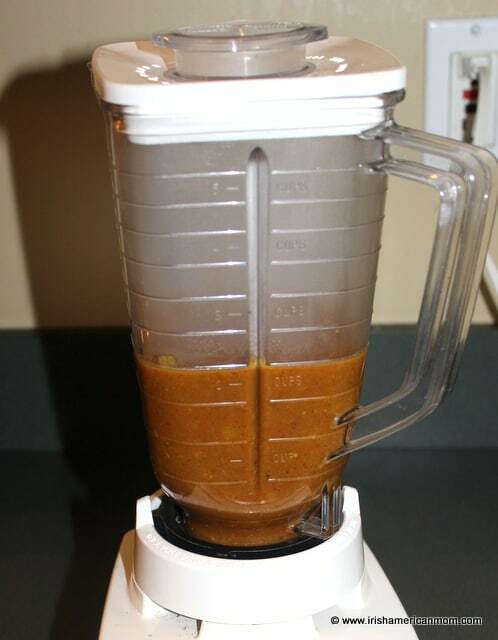 When cool enough add the sauce to a blender or food processor and blitz until smooth. Step 11 Return the sauce to the pan over medium heat. Add golden raisins if desired. Step 12 Serve hot with a side of chips or french fries. What’s the difference between Tumeric and Curry powder? I thought they were one in the same? Cathy – Curry powder is a blend of spices that can include coriander, cumin, turmeric, pepper, mustard, allspice, fenugreek, cloves, ginger and cinnamon. 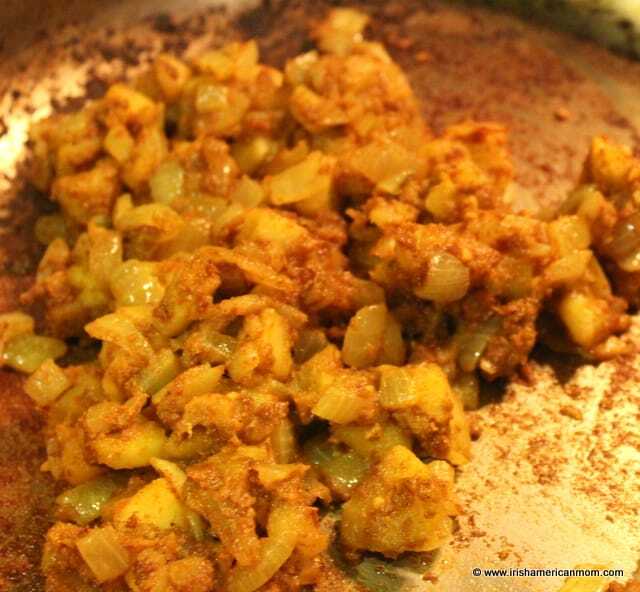 I always add extra turmeric and other spices to my curry powder to give the flavor a little extra spiciness. I find American curry powders are very, very mild, so I always spice it up a little. Turmeric is a deep yellow spice, not a combination like curry powder. Years ago I spent some time in India working with children who had polio. When I was there I watched how the women cooked and they always added extra turmeric to their curries. This looks delicious. You’ve just scared me into not wanting to order curry at chippers(I’m vegetarian) the next time I go to Ireland because you used chicken stock in this recipe? Do you think the curry in this recipe would taste the same with vegetable stock instead? 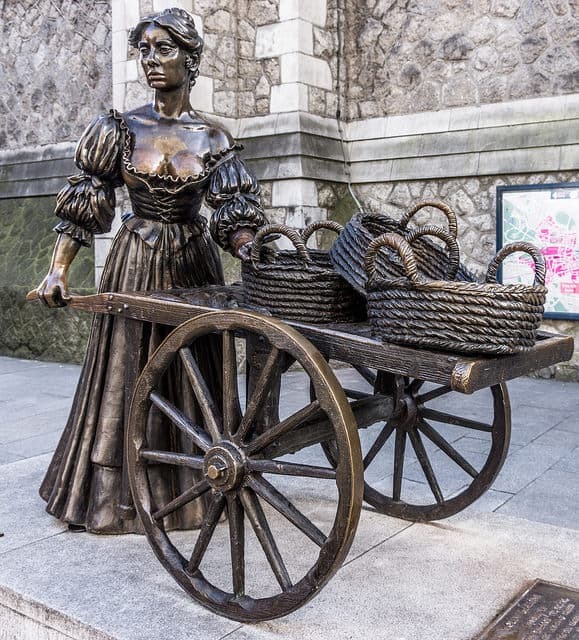 Maeve – Vegetable stock would work fine, or even just plain water instead of the chicken stock. I don’t think the chippers in Ireland use chicken stock at all, so don’t worry about ordering curry next time you are in Ireland. Most of the time their sauce is from a pre-packaged mix made by adding water. I just like the flavor of the chicken stock in this sauce, but it is not a key ingredient. If I were a veggie I would check whether they cook the chips in lard, which the more renowned places like Burdocks may do. I seriously doubt there’s any chicken stock in anyone’s curry sauce. Yum! You have me curious to try this with your statement of American curries being mild! I’m sure my husband would love this though! I tend to be on the milder side of spices, whereas he likes ‘flavor’. 🙂 And I’m beginning to love turmeric! The health benefits are amazing! Aimee – I love Indian food. I spent many months there years ago, and marveled at the array of spices and aromas used on a regular basis. I always add additional turmeric to my curries. You are so right, the health benefits are amazing. Curries are not a traditional Irish food, but curry sauce and chips is ever so popular, especially on a Saturday night as people wander home from the pubs. I’ve been looking thru your recipes and can’t wait to try them. 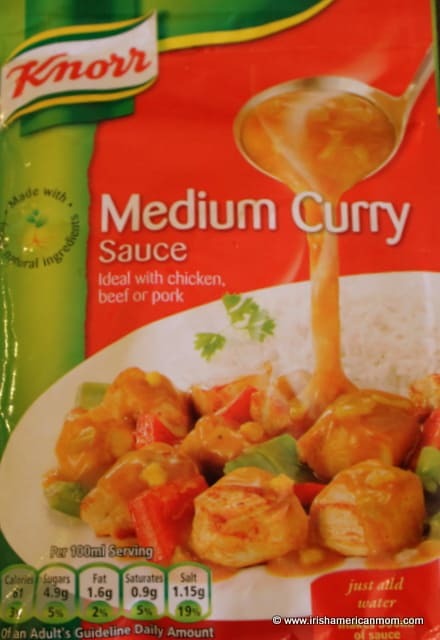 I do have to admit, one of the things I load up on, on visits home is Knorr Medium curry sauce, LOVE it, make curry chicken, curry chips and now one of my girls loves it. Orla – My little girl also loves chicken curry and chips and curry sauce. My boys won’t let it past their lips unfortunately. So glad you found my site and hope you enjoy my recipes. I have plans for plenty more Irish cooking and recipes over the coming weeks and months. Stop by whenever you get a chance. Thanks so much for the recipe!! I have been craving veggie curry & chips since I arrived home from my trip to Ireland in January. So hard to find an equivalent here. I am so eager to try this recipe with veggie stock, and see if I can recreate that delicious meal I had from the chipper several times late at night. Danielle – I hope my version of curry sauce will satisfy your cravings for this little taste of Ireland. I always get chips and curry sauce from the chipper when I am home. Yummy!!! Thanks for stopping by. Glad you found my website. This sauce is, in a word, epic. Thank you for taking the time to share it! Jeremy – Thanks so much for taking the time to leave a comment with your seal of approval for this curry sauce. Glad you enjoyed it. For me, it the perfect accompaniment to chips. 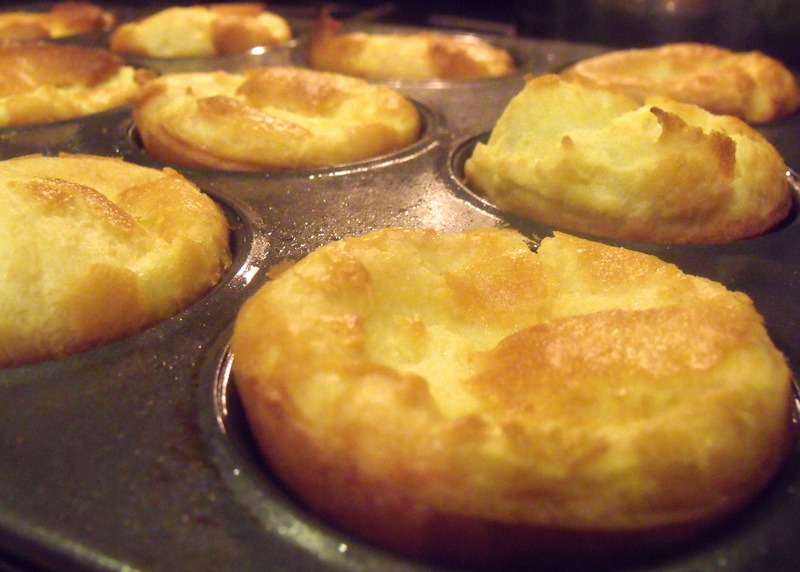 I’m so pleased to finally find a good recipe for this – it is one of the things I miss most about home. Thanks so much for posting it! 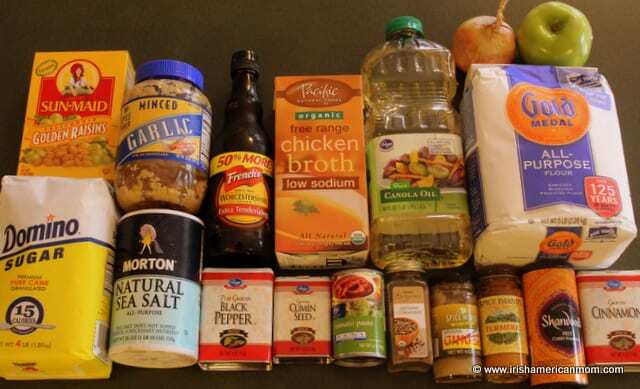 Quick question – are your tablespoons US measures (i.e. dessert spoon) or Irish measures (i.e. double that)? Hi Ciara – My measurements are US. I try to convert all my old Irish recipes and tweak them so they work in America. Glad you found my site and I hope you enjoy these chips and curry sauce. It is one thing I love to make to remind me of home. Thank you for sharing. My boyfriend and I had chips and curry sauce at an Irish pub in Phoenix and wanted to make our own. This is spot on! I can’t wait to try more of your recipes. 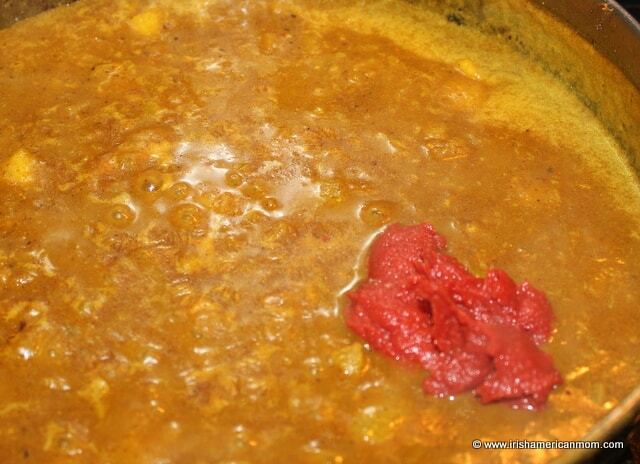 Lisa – I’m so glad you enjoyed this curry sauce recipe. I like the balance of sweet and spicy flavors, especially when poured over chips. Thanks so much for stopping by. Hi, can you give a specific measure for salt and pepper? Just a sprinkle, or more? I don’t know if I get it right since I don’t know what it should taste like. A 1/4 teaspoon of each should be fine. You can always add more at the end, seasoning the sauce to taste. This looks great, I opened up a food Truck in Woodside, Queens with a large Irish Population, and they keep asking for it. I will try it soon and let you know their response. One question I have for you is how long will it stay freash for in the refrigerator? Patrick – So glad you found this recipe and I hope it is a big hit with all your Woodside customers. To be honest, I have never kept this sauce for more than a day in my fridge. If I have any leftovers I serve it over grilled chicken the next day. I guess it would be safe for up to 3 days in the fridge if stored properly in an airtight container. excellent curry sauce recipe, tastes like the “irish” sauce served in my local chippy, i cant wait to pass this recipe on to my friend joona. he will love this too. So glad you enjoyed this curry sauce. Thanks so much for taking the time to comment with such positive feedback. Love chips and curry sauce. We always had ours with coleslaw from the chipper in my local town in Co. Clare. You should try it, brilliant flavour combination. Lynda – I’ve only had coleslaw with plain chips, never with curry sauce and chips. I’ll have to try it sometime. It sounds like an interesting flavor combination. This is fabulous!! I’ve been trying to make this sauce on my own since I tried it on my last trip to the UK and you gave the perfect steps and ingredients. I have everything to make it in the house except for the apple, but I do have applesauce so I will substitute that until I can get to the grocery store. I especially like your suggestion of adding raisins and blending. The photos are great, it really looks like authentic English chips and curry! I made this last night (along with chicken balls&fried rice) and I don’t think I’ll order takeout again because your sauce is so good. I am living in Ireland and can get the curry sauce you crave, but yours is way better!! Do you always make it to order or have you done bigger batches and frozen it? 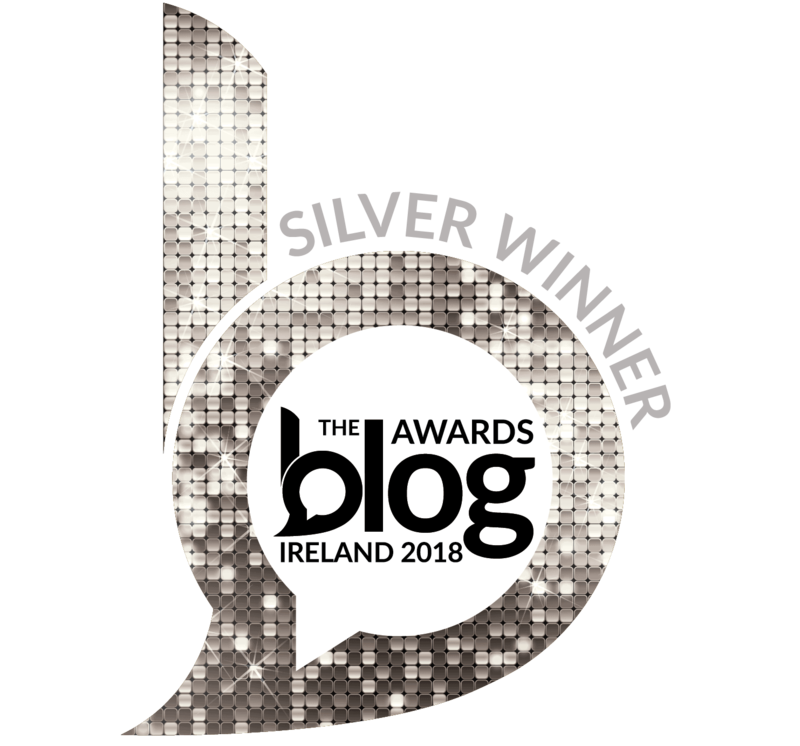 Maebh – I’m delighted you enjoyed my curry sauce so much. I have not yet made a big batch for freezing – it seems to disappear with no leftovers every time I make it. I think it should freeze well. I’ve frozen a chicken curry I make which is similar and it held up well to freezing. 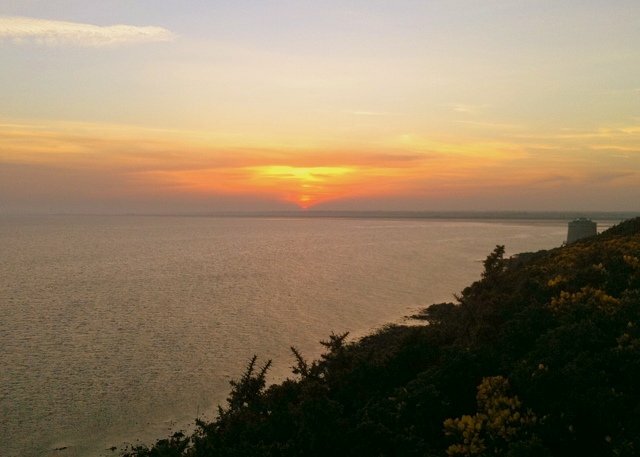 Mairead, I love you site, thank you so much for sharing with us! I was making a batch of your curry sauce yesterday and was wondering what type of curry do you find works best, while digging through my spice pantry I found I had several…. Madras, Sweet, Hot, Garam Masala, and Maharajah. Also I was wondering if you have ever used creamed coconut or coconut milk in your curry, The County Clare here in town has a great chips and curry sauce but I swear I pick up a hint of coconut in it, next time we go I am going to have to ask the chef! Thanks again! Dawn – I haven’t used coconut milk for this curry sauce, but I do make a Thai chicken curry with coconut milk which my hubby loves. If you ask the chef at The County Clare for his recipe, I hope he shares his secret ingredient with you. My favorite curry powder is Sharwood’s, which I can by at my local Meijers. They have a good English food section. I think Madras curry will be hot and spicier than the others you have on hand. For this sauce the sweet curry powder might work nicely to combine with the fruit. Wow, I love this recipe. 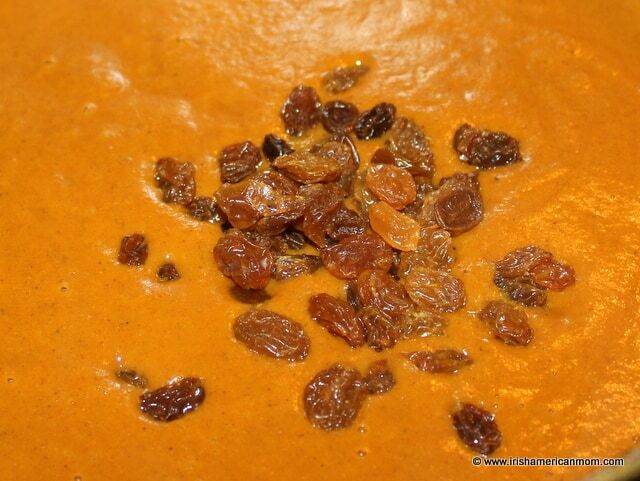 I was hesitant to add the raisins after blending the mixture but I loved the final results. I was able to find the recommended curry powder at my local grocery store (Publix). My sister does not like spicy foods and didn’t mind the heat level. The spiciness does not linger. I served this with panko crusted chicken and french fries. Everyone cleaned their plates and asked me to make this dish again. Thank you for sharing this great recipe!!! I think it’s popular in England and Wales too. Curry sauce is just great with chips. Take a bow! I was searching for the taste that i had found in Athlone during my studies (10 years ago) and you made me realize that i still miss that. Gonna try the veggie version of the recipe this weekend! Just had to tell this! PS: Just a tip, please improve the key tags for landing on this webpage as only curry chips leads to this page. Search terms like French fries with Gravy, fries with gravy all lead to poutine. Just my 2 cents. So glad you like this recipe. I hope it brings back tasty memories of your days in Athlone. Thanks also for the tip about my tags. I’ll take a look and see how I can beef them up to ascend the Google listings. I love this recipe. I am from Northern Ireland, now living in America. I have been trying SO many sauce recipes, but I LOVE this one. So flavorful. Thank you. I live in Kentucky too! 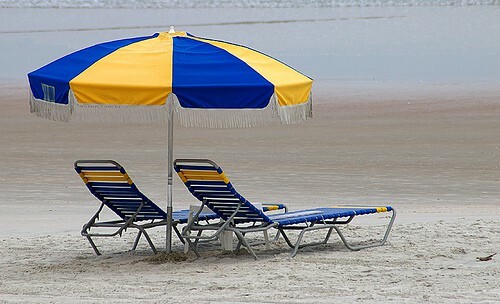 Are you still in Kentucky? 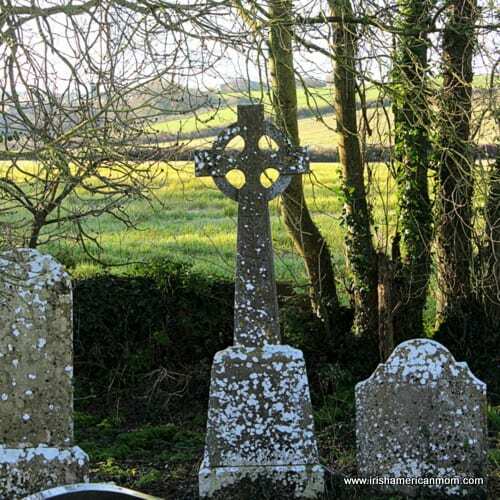 Eunice – I’m in Louisville – when not there I’m usually in Ireland, helping my folks. Glad to know there are a few more of us based in the Bluegrass State. I just tried the sauce and found it pretty great! I did not like the way it was finishing up as it was quite grainy, which I felt was more to do with the cinnamon powder (Kirkland, Costco) than anything else. So I added a bit more water and a teaspoon of Chilli powder and cooked for an extra 15 mins. It needed the chilli as the curry powder (Suraj brand) needed a kick. I then did give it a few pulses in the blender and done. I had it with chips and mushy peas. Really did end up being tasty and authentic. We are in BC Canada, moving here from the UK (Myself Manchester, wife Sinead from Belfast) and have not had a decent chip shop style curry sauce. We are in the process of opening a British fish & chip shop. 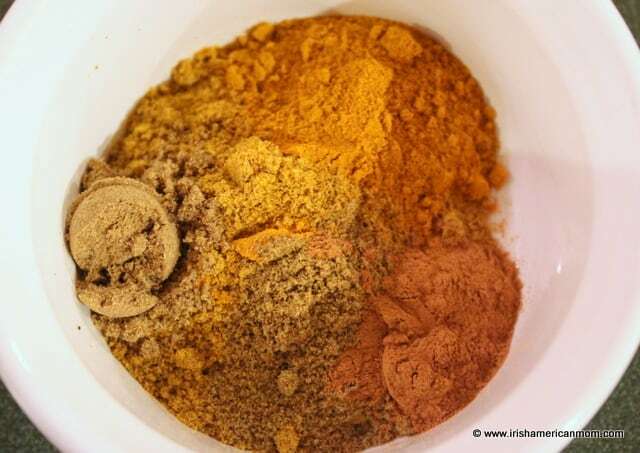 If I can’t find a decent curry powder then I will make our own, based close to this recipe! Andy – Thanks so much for stopping by with such great feedback about my curry sauce recipe. I’m so glad you were able to tweak it a little to get the result you were looking for. I find I get the best results with Sharwood’s curry powder. Their spice blend just has the perfect kick for my palate. I haven’t been able to find an American curry powder blend that comes anywhere close to Sharwood’s on my taste tests. Luckily my local supermarket has an English section where I can buy this curry powder. Wishing you every success with your new fish and chip shop venture, and I hope your customers will enjoy chips and curry sauce as much as we do in England and Ireland. Really appreciate you posting your recipe. When I was in London I had curry and chips every chance I got and that was more often than not. You are correct there aren’t a lot of places to get it. But i have found a couple of supermarkets. One market here in NC has a jarred Vendaloo sauce that is actually made locally! Then I have another jar of powdered curry but have never tried to make it. I think I will try that with your recipe for the first time. Raisins added to the sauce sounds outstanding! Gotta try that. But I think I’ll stray away from using prunes lol. Anyway this is almost like a southern comfort food to me now. Thanks for sharing gonna try. 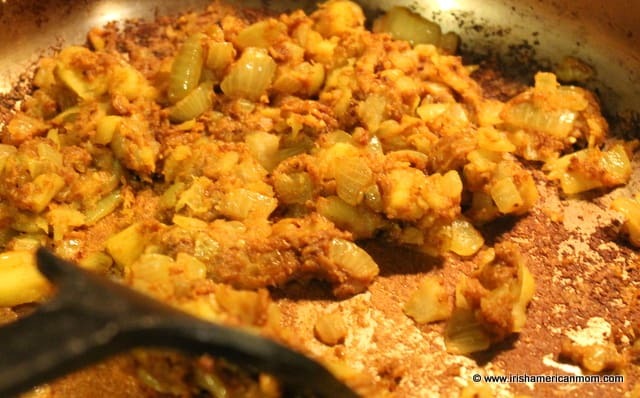 John – I hope my recipe will satisfy your cravings for curry. Matched with nicely cooked chips, this truly is comfort food at its best. I loved this as a starting base. I may try to make this a sweet curry next time to compare. I used a dark roux (about a 1/8 to 1/4 cup) instead of raw flour since I had some leftover in my fridge from a gumbo. I made my roux with grapeseed oil and high quality flour. I also added a little white sugar as stated in your recipe, but had a bit of unbalanced heat so I added a dash of apple cider vinegar and instead of golden raisins I added about a tablespoon of dark brown sugar. This is amazing with rice, I can’t wait to try it with chips! Hi Marlene – Thanks for all these wonderful tips and variations on this recipe. Apple cider vinegar is a great addition to balance heat. It’s lovely to hear from readers who have modified and tested my recipes. There are always so many ways to tweak ingredients to get the perfect blend for every palate. I used to be able to get Knorr’s Curry Sauce mix in the US, and I loved it on lamb and beef. It has not been available for several years, and i find that I can only get it from Ireland or Irish food US internet sites, or German sites. Is this recipe good on meats or would it be a different curry sauce recipe? Hi Peter – This curry sauce is a little fruitier than Knorr curry sauce mix, and it goes really well with chicken. I think it would work great over lamb too, but I don’t think it would pair as well with beef. When I make a beef curry I use a little more ginger and chilli than in this recipe. Like you, I can only get Knorr sauce packets online in the US. I wish my local supermarket would stock it. I was able to get it at World Market once, but recently I have only seen a Knorr Currywurst sauce for serving with sausages. How does.this compare to curry wurst sauce? I would think it would be great on wurst. Hi Mary – I must confess I have never tried currywurst, but I think this sauce should taste great on wurst. Let us know if you ever give it a try. I think I am going to make the curry sauce this week-end. Will give it a try on some wurst. As I recall, currywurst has a tomato sauce base. I love your column. Thanks for all the great recipes. Mary – Thanks so much for checking out my recipes and ramblings. Good luck with your currywurst. Let me just say this is not the Curry Sauce you get from an English Chippy….its sooooooooo much better. I moved from the UK to the US 4 years ago and still miss going to the Chippy for a take out on a Friday night. So most Friday nights I make chips and my husband and I have a huge plate of them each, smothered in Salt and Vinegar. Now thanks to you we have Curry Sauce over the top as well….really delicious. We now live in Brunei and were craving traditional UK Fish & Chips so did a Fish & Chip supper night for all of our expat friends. I made this recipe and it went down a treat. Thank you for sharing it. Thanks so much for stopping by to give this curry sauce your seal of approval. It’s lovely to hear from readers all over the world who have tried out my recipes, shared them with friends, and enjoyed my flavor combinations. Like you, I love a good fish and chips dinner every now and then – it’s a lovely reminder of home. I am just wondering if you are using green apple? Based on the photo of the ingredients. Hi Angie – I used a Granny Smith apple. I like the flavor it adds to the sauce. Thanks for stopping by and checking out my recipe. I hope you’ll enjoy it. Thanks for this recipe. It was just what I was looking for to perk up plain turkey steaks and was delicious with the mash and veg too. My version may have been a bit spicier than intended as I didn’t read the comment about US tablespoon size until afterwards! I will be making this often from now on, especially when we get a takeaway from the chippy. I must say that I made this with gluten free flour with no problem. Madeline – I’m delighted to know this recipe worked out great using gluten free flour, and that you give it two thumbs up. It’s lovely to hear from readers who try my recipes and enjoy them. Can this be made in large batches and canned? OMG! I can’t wait to make this tonight! I go to Ireland to visit my cousins and there is NOTHING like curry chips after hitting the pubs! This by the looks of it is the closest to what I am use to over there and can’t wait to make it! I even have my daughter Fiona hooked on curry sauce. We make oven fries with russet potatoes, sweet potatoes, carrots and parsnips. She loves them all dipped in curry sauce. She is going to love this! Thank you so much for sharing! Hi Bridget – I hope your little girl enjoyed this curry sauce. My little girl LOVES it and is great for dipping chips or veggies in it. Thanks so much for checking out my recipes. Best wishes, and happy New Year to you and yours. Im super excited to try this. I grew up in co.cork and i miss getting curry chips from the chipper wrapped in that paper wrapping. Moved to california 15 years ago and now pregnant Im really craving some authentic curry. I use to be able to get the colmans curry or knorrs version but its obsolete here now. Do you know where you can find golden raisins? Can i use regular raisins or no? And can i use any kind of plain curry powder? I’M canadian and I’ve never had this before. I did, however, make it for a friend who is from Cork! He was talking about it so I made it exactly as per the recipe. He said I nailed it and was so thankful. Apparently it’s good haha. I loved the taste but had nothing to compare it to. Hi Stephanie – Thanks so much for telling us your Irish friend gives this recipe two thumbs up. That’s great to hear. Hi Marie – I understand how you are craving curry during your pregnancy. When I was pregnant with my first, curry was just what I wanted. I used to go to a Dallas sandwich shop for a curry chicken salad sandwich, every day or two. One day I arrived only to be told it was taken off the menu. I had to go home and create my own. I hope this curry sauce will satisfy your curry craving. In Kentucky I can get golden raisins in all our local supermarkets. Trader Joes carries them too, so you should be able to get them there in California. But don’t worry about golden raisins, since regular ones will work just fine too. I only used the golden ones for their coloring in the yellow curry sauce. Any curry powder will work too. There’ll be subtle flavor differences depending upon the curry powder used. Whenever I can find Sharwoods I use it, but Trader Joes and Whole Foods have a nice curry powder mix too. Happy curry sauce cooking, and I hope you take plenty of rest during your pregnancy and put your feet up to enjoy your curry sauce. I usually find golden raisins in the bulk section of the supermarket or in the box on a shelf that may be near other fruit such as canned. Any non hot curry powder or a sweet curry powder would work well. Hi Marlene – thanks so much for those buying tips. Oh and funny that. I just relocated from California to Kentucky. Welcome to Kentucky – I hope your move brings you happiness and success. Take care, and hope your unpacking goes quickly and smoothly. Ever since me and my wife call it the IRIS DISH. Hi Prateek – So glad my “Irish curry sauce” reminded you of your lunch in Waterford. Chips and curry sauce may not be even dreamed off in the parts of the world where curry originated, but it is ever so popular in Ireland. Fries in the United States just aren’t the same as Irish fries. That’s because American potatoes are not as starchy as the potatoes in Ireland, which really do make perfect chips. Best wishes,and thanks so much for checking out my recipe. Hi Cyril – So true – most chip shop curry sauces are probably reconstituted from pre-made, dry curry powder. But no matter which curry sauce is paired with chips, I believe curry and chips are perfect together. Hi Jessie – I’m delighted to hear this curry went down a treat in your house. You can’t beat Irish style curry. Thanks for stopping by to share how much you enjoyed this recipe. Don’t forget the mushy peas 🙂 I’ll definitely be giving this recipe a try. I’ve only ever had chicken curry and chips once (at an Irish Pub – but not in Ireland). It was one of the best restaurant meals I’ve ever had. Thanks for sharing your recipe. Thanks so much for stopping by and letting us know about your wonderful Irish pub meal. Nobody really appreciates chips and curry sauce until they have savored the wonderful flavors. I had just come back from a trip to Ireland and curry chips changed my life. However, I think I recognize the flavour of the sauce. It’s the same as Glico or Golden Japanese instant curry! If you go to an asian foods store, i’m sure you’ll find the stuff which comes in bullion style cubes or powder; just add water and heat up for delicious sauce. Hi JP – Thanks so much for this tip for buying a good curry sauce in America. It’s amazing how many are introduced to the flavor combination of curry sauce and chips in Ireland. So glad you like this Irish favorite. My Cork-born bf was well impressed when I made this for him last week. I’ve been asked to make several batches for him and his crew’s Paddy’s day party coming up. Thank you for the recipe! Hi Shelly – I’m delighted to hear my recipe got your boyfriend’s approval, and that it has been placed on order for your St. Paddy’s Day party. 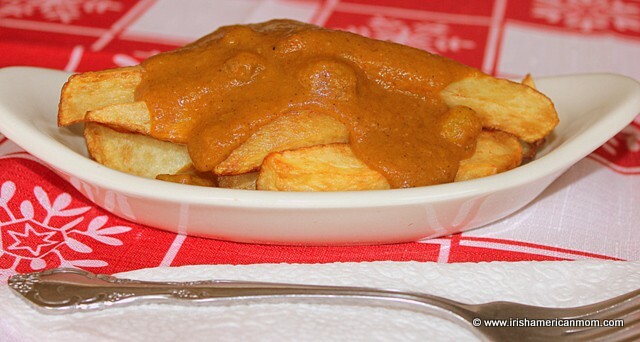 Chips and curry sauce are a big hit in Cork and all over Ireland. Thanks so much for taking the time to give such positive feedback. I made this for dinner and the kids loved it. We put it on steak fried and grilled chicken. We all agreed that the next time we make pork schnitzel we are making this sauce to put on it. The sweet apple flavor would go so well with the fried pork. Hi Bill – Fried pork would definitely be delicious with this sauce. I’m so glad your family enjoyed it. Thanks for stopping by. This recipe is to die for! I have been craving curry fries for months and I finally have a recipe for them! And its SO QUICK and SO EASY! Hi Heather – So glad you like this recipe and deem it a keeper. It’s a favorite in our house too. I used this as a guide, and it was terrific! I didn’t have any ginger or garlic, so I used 2 tsp of Massaman Curry Paste. Also did not have apples, so used 1 cup of sweetened tamarind juice. Again, no Worcestershire, so used fish sauce, and ketchup instead of tomato puree. This was fantastic! I gave it a blast with the hand blender, and finished it with a cornstarch slurry. Definitely authentic tasting – this is the stuff! Thank you! Hi Heather – Lovely to hear your curry sauce tasted authentic. I love how you say “this is the stuff.” For me too, this is real curry sauce. Thanks for letting us know about all your successful tweaks to this recipe. It’s great to know how to change things up a bit. Take care, and thanks for taking the time to leave your feedback here. Thank you !! From a Scottish mum! Not sure if I posted this before. Just wanted to thank you for sharing this, it was a bit of a search to find a decent looking recipe. I’m making it tonight! I’m sure I will love it. Hi Omar – I hope you enjoyed this curry sauce. Thanks for checking out my recipe. Just finished putting this in glass jars for my dinner french fries this week. I used a Maharajah Style Curry from my local spice house that turned out to be a bit spicy for me. By adding a half teaspoon of fresh lemon juice to the finished product, the curry sauce turned out just right. I’ve never had Irish curry and chips, but I love to make curries for dinner and was looking for something besides mayonnaise or ketchup or thousand island dressing for my fries that wasn’t loaded with sugars or fats. I think this will be a delicious change! Based on the taste profile, I could see using this on pan fried potatoes or on rice–as well as on chicken, of course. Thank you for posting this. By the way, I also loved your Shepherd’s/Cottage Pie recipe. It’s my new favorite for that dish. Thanks so much for stopping by to let us know you liked this recipe. 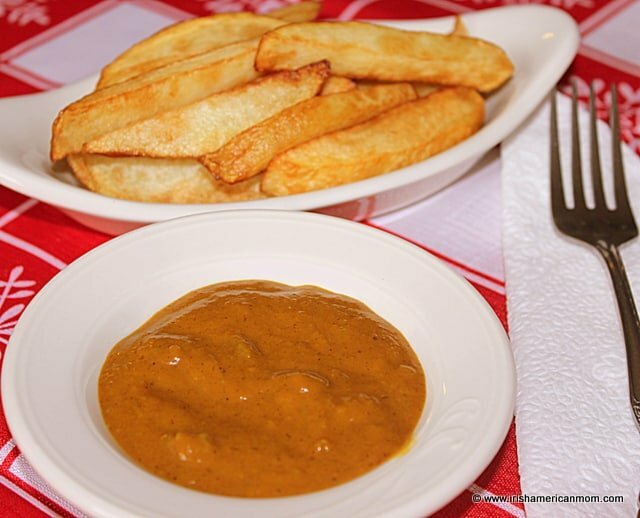 Chips and curry sauce is enjoyed throughout Ireland and the United Kingdom. Curry compliments fried potatoes just perfectly. I’m thrilled my shepherd’s pie gets your seal of approval too. Happy cooking, and enjoy your fries with curry sauce. Hope you enjoy this recipe Niamh. It’s one of my favorites. Hi Mairéad this looks so yummy. I’m going to try it this weekend. As an aside, there’s an advert running on Irish TV for a curry chips sauce. Its a knock-off of that old kitchy Ferreo Rocher ad…thought you might knock some sport from it.